National Stationery Week is back for its seventh year and will run from Monday 23 April to Sunday 29 April. The week aims to celebrate stationery in all its forms and uses and encourage everyone to write more by hand. …with the UK stationery industry’s own trade show, the London Stationery Show which runs during the same week, looking after Wednesday, 25 April with the theme #stationerytheworldover. Each company is taking a different day and setting challenges and competitions for stationery fans to join in with – they will be encouraged to share their own stationery projects and ideas, and to take part in competitions throughout the week to win lots of stationery goodies! Retail support for the week has already been pledged by Ryman, kikki-K, Monsoon, Fedrigoni, The Pen Company, Paper Tiger, Got2Jot, Noted in Style, Office Outlet, Martha Brook, Chroma Stationery, Herts FullStop, Ampersans, Mulberry Bush and Early Years Resources. 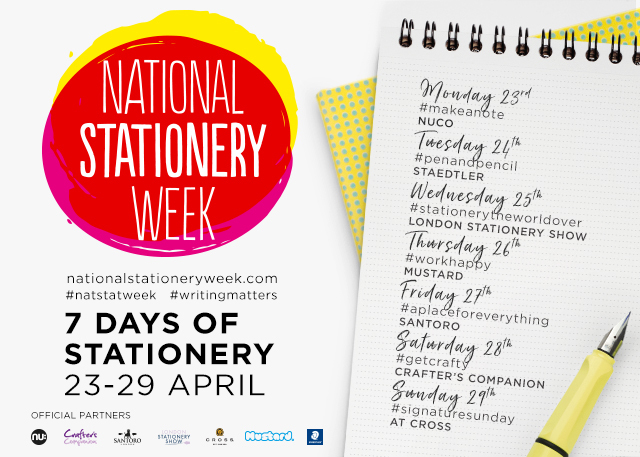 Interested retailers should visit www.nationalstationeryweek.com and complete the Retailer Sign Up form on the ‘Get Involved’ page. Suppliers have also pledged their support and received the campaign artwork to run their own activities throughout the week – they include Stone Marketing, Gorilla Glue, Abrams & Chronicle, Boxclever Press, Maped Helix, Bostik, Pyramid International, Sparkfold, Sinclairs Products, Rhino Stationery, Otima, Little Lamb Design, Noteshel, Mohawk Paper, DKL, ExaClair, NPW. Special mentions and big thank you’s this year must go to the design team at Mustard who devised and produced all this year’s key campaign visuals; to G F Smith, who created bespoke goodie boxes in the campaign colours to send out to top consumer journalists and bloggers asking them to support the campaign (photos available), and Wren Press who have created a campaign poster for retailers to order in lots of different sizes. All retailers and suppliers can request the campaign artwork and a copy of the campaign’s A-Z of ‘Why Writing Matters’ to help spark off ideas or challenges to run in their own stores. The National Stationery Week team are then on hand to help source expert opinion, graphologists and recommend stationery suppliers to help with competition prizes galore!